Of the six, five are state seats. The sole parliamentary seat targeted is Padang Serai, held by N Gobalakrishnan. KUALA LUMPUR: The Human Rights Party (HRP) plans to contest in five state seats and one parliamentary constituency in Kedah which have 20% and above Indian voters. The party’s secretary-general P Uthayakumar said the five state seats were Bukit Selambau (29.5%), Lunas (22.5%), Merbau (22%), Sidam (20%) and Gurun (18.4%). The sole parliamentary seat was Padang Serai, currently held by former PKR strongman, N Gobalakrishnan. “PAS is ruling by a majority of a mere two seats when compared to 14 seats held by Umno/BN and PKR having five seats, DAP one seat and one Independent in the 36-seat Kedah state assembly. “So if HRP wins in these five state seats, they will be the real ‘kingmakers’ and can seriously push for change vis-a-vis the Kedah Indian poor at the highest political level,” said Uthayakumar. He added that the Indian poor have to be politically empowered to effect changes at the highest political level as both Barisan Nasional and Pakatan Rakyat have refused to address the pressing Indian problems. Uthayakumar asked PKR, DAP and PAS to make way for HRP candidates in these six seats in Kedah for a one-to-one contest with BN. “Unless and until the Indians are politically empowered like Dr Mahathir (Mohamad) in Kubang Pasu (95% Malay-Muslim voters) with at least the creation of 51% Indian majority constituencies under HRP’s ‘Project 15/38′, the Indian poor are doomed. “They are destined to become the 19th century ‘negros’ as in the US,” he added. HRP to contest five Kedah DUN & one Parliament. PAS ruling by 2 seat majority to UMNO: 350 attend Kulim dinner in recognition of 54 activists prosecuted. The event began at 8.00 p.m. with a one minute silence for the late Sg Petani Hindraf leader Raj Manian who passed away on 26/5/11, about one year after his opposing the demolishment of the near 0.9 hectares 100 over year old Ladang Batu Pekaka Hindu cemetery on 29/1/2010 (Thaipusam day) by no other less than PAS “for all muslims” to build the 832 acres University Insaniah. We have been made to understand that Raj took this “ethnic cleansing” very badly that contributed to his untimely death. The Chinese cemetery within the compound of UPM was however preserved when the Serdang Agriculture College expended to become UPM. And to add insult to injury tens of acres are being made into recreation for students and hundreds of acres were retained as the University Insamiah reserve land. So why the haste in exterminating this Hindu cemetery? 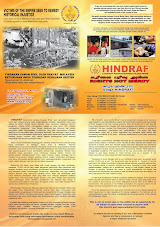 Kedah HRP and Hindraf Chief R.Ramu spoke on how at the last general elections both the traditional Indian reserve DUN seats of Bukit Selambau and Lunas were refused to be given to Opposition Indian candidates but snatched up by the greedy and racist PKR just to field malay muslim “winnable” candidates. UMNO/BN at the very least stuck by giving these seats to Indian candidates. Hindraf & HRP National adviser N.Ganesan spoke about how 12A+ top most science student Kugnethran a/l Parmusuan who could not have possibly scored any higher, was denied his first choice to pursue a medical degree (overseas) but instead was offered a mere Diploma in “cow grazing”. (animal husbandry) at UPM. How the racist UMNO reduces this p otential Cardiologist into a “cowherd”. The sole Parliamentary seat in Kedah is Padang Serai (22.28%). P.Uthayakumar reiterated that this is the only way forward in facing the 13th General Elections which is expected in July 2011. He pointed out that in Kedah, PAS is ruling by a majority of a mere two seats when compared to 14 seats held by UMNO/BN and PKR having 5 seats, DAP 1 seat and one Independent in the 36 seats Kedah State Assembly. So when HRP wins in these five DUN seats, they would be the real “kingmakers” and could seriously push for change vis a vis the Kedah Indian poor at the highest political level. This is like HRP’s decision to contest in seven (7) DUN seats of Buntong with 54% Indian voters, Hutang Melintang (33%), Jalong and Changat Jong each with 27%, Jelapang (21%), while Pasir Panjang and Sungkai each with 20% and three Parliamentary seats of Ipoh Barat 22.5% and Bagan Datoh 23.3% and Sungai Siput 22.6% that P.Uthayakumar had announced at a similar dinner in Ipoh on 14/5/11. And similarly the Sri Andalas/ Kota Raja seats in Selangor, Port Dickson/ Teluk Kemang seats in Negeri Sembilan, Tanah Rata/Cameron Highlands seats in Pahang and Puteri Wangsa/ Tebrau seats in Johor as the first phase of HRPs’ Project 15/38 in seven (7) frontline states.. The Indian poor have to be politically empowered to effect changes at the highest political level as both BN and PR have refused to address the pressing Indian problems. P.Uthayakumar asked PKR,DAP & PAS to make way for HRP candidates in these 5+1 seats in Kedah for a one to one contest with B.N. as part of HRPs’ strategy in ousting UMNO from it’s 54 year old hegemony of Putrajaya. Unless and until the Indians are politically empowered like Dr Mahathir in Kubang Pasu (95% malay muslim voters) with at least the creation of a 51% Indian majority constituencies under HRPs’ Project 15/38, the Indian poor are doomed. They are destined to become the 19th century “negros” as in the USA. Polis Bodoh: Though true , Gani Patail maliciously prosecutes and jails Nur Shafa (20). Just watch CSI and you will see the high level quality and standards of police investigations before even arresting, let alone throwing someone in jail. But racist UMNO Prime Minister Najib Razak’s One Malay-sian Polis Raja Di Malay-sia takes advantage of especially the Indian poor. Having no money for bail, no legal fees for lawyers (with zero or a wayang kulit RM 5 million Legal Aid to 28 million Malaysians), no family support, thousands of the Indian poor are deemed guilty in the eyes the Malay-sian law and spend years in jails irrespective of whether they are guilty or not. And then only to “graduate” as the real criminals having mixed with the real criminals. And with this set of facts the Malay-sian government says that some 45% of the country’s crime are committed by the Indian poor when they form only 8% of the population (disproportionate by about 600%). Thus the UMNO creation or “social engineering” by default of the new “criminal class” Indians within the last 20 years. Give these Indian youths equal business opportunities, licences, permits, projects and contracts and we will see at least a 95% drop in these Indian crimes.